Give those around you affected by Lymphoma cancer hope each time you use this Lymphoma Cancer Awareness Key Chain. This eye catching design is sure to get you noticed and will help spread awareness wherever you go. Your Personalized Key Chain measures 2¼" x 2¼" and is a 1/8" thick. Made of reinforced plastic and includes a key ring. Includes FREE Personalization! 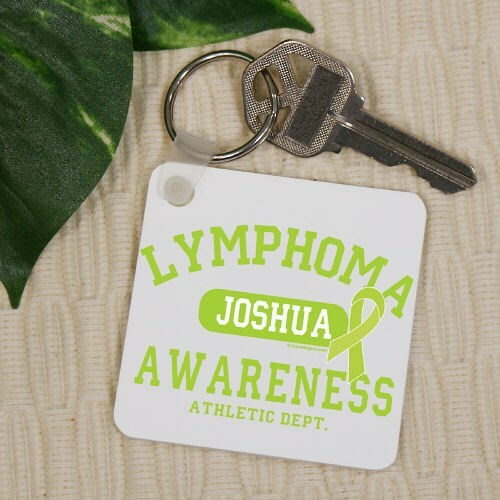 Personalize your Lymphoma Awareness Key Chain with any name. Take a look at our ever growing collection of Personalized Lymphoma Awareness Apparel and Walk Gear to show your support today. Walk in style with this Lymphoma Cancer Awareness Key Chain or our Lymphoma Cancer Hope Awareness Hoodie at your next awareness walk. Be sure to also take a look at our Lymphoma Awareness Water Bottle to spread awareness every day.